When I was a child in the 1950s my father worked in the Art and Industrial Division at the National Museum of Ireland. He subsequently became a noted military historian but until I was five or six he was an assistant keeper at the museum, with responsibility for the Military History and the War of Independence collections. When I visit the museum today I can still feel his presence. He was fascinated by archaeology as well as history and so passionate about Ireland's past that even at that age I learned to share his enthusiasm. It was a passion rooted in a philosopher's sense of the universality of human experience as well as in delight in his own cultural inheritance. And, above all, it was founded on a pursuit of truth. Looking back now, I'm aware that his uncompromising insistence on the importance of facts over nationalist sentiment must have made him unpopular in some quarters in the Ireland of his time. But as a child I just loved his stories. Not that I grasped many facts at the age of five of six. Instead I received a kaleidoscope of impressions, a sense of excitement and drama, colour and texture, discovery and delight. It has lived with me ever since. I remember him lifting me up to admire Iron Age ring-beads of translucent black glass with spiral yellow inlay, and twisted gold collars with gorgeous fluted ends. There were amber beads and inlaid boxes too, enamelled horse-bits, jet ornaments, and ceremonial trumpets. Unlike their later, medieval counterparts who laboured over complicated strap-work and heavy decoration, Iron Age craftsmen produced works that are almost modernist in their simple clarity. That early experience in the museum sparked a lifetime's ambition to achieve the same simple clarity in my writing. It also produced a misunderstanding that, in hindsight, has clarified my understanding of my father as a historian. 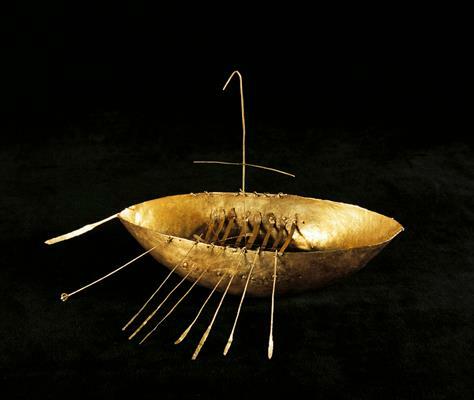 Among the artefacts in the museum is a little boat which was probably a votive offering to Mannanán Mac Lír, the ancient Celtic sea god. It’s a perfect model of a sea-going version of a naomhóg, the slender, curved coracle still used round the west coast of Ireland, where I live today. About seven inches long and fashioned in beaten gold, it was ploughed out of a field in 1896, by a farmer whose name was Tom Nicholl. Several little objects were found with the boat, one of which I saw in my childhood as a slender, golden spear. To me that made sense. I knew from stories about ancient Irish voyagers that saints and explorers hunted whales for food. And I’d been told that the Celtic sun god, Lugh, wore a golden collar and carried a spear of light. So I imagined Lugh and Mannanán sailing the golden boat to towards the western horizon and finding the Isles of The Blessed. I know now that the object I saw as a spear was actually a model of the steering oar that guided sea-going naomhóga.I know too that no offering’s ever been found that links the Celtic sea and sun gods as neatly as I linked them then in my imagination.But I also know that imagination itself, balanced by discipline and meticulous research, has a vital place in our understanding of the past. It's a lesson I learned from a father whose own rigorous, uncompromising scholarship was informed by an imaginative awareness of the universality of human experience. I wonder about many of those objects. I keep coming back to the conversion of a chair to a throne in Knossos. There are certain realities about coracles, longships and the like. As designed the sail can only be used with a following wind so the need for a tiller of that length, really of any length would flip the craft across the wind and either upend it or send it scudding over the water sideways. Ask any of the users of the naomhóg down your way. You see what's needed is a keel. One can never be certain about the purpose of such artefacts but, given where it was found, it seems likely that it was a votive offering to Mannanán. Naomhóga under sail were commonly used as fishingboats in Corca Dhuibhne within living memory, and the Tim Severin's reconstructed seagoing naomhóg also had no keel. Yes, you can have the sea and the wind coming from different points of the compass. Normally, you face the sea. But you cannot head to sea if the wind is spinning you. And those things are like bucking horses in the lightest breeze, god only knows what the big ones were like on a crossing from Tory to Iona. But back the other way would be unbelievable. Mind you the bigger the sea the safer they'd be since they could ride em like a cork in a bath. Strawberries and Cream in a Writer's Dream Venue.